Named after the beautiful 164 foot Nojoqui Falls, 6 miles SW of Solvang, California. 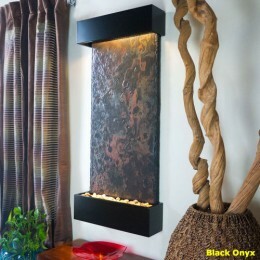 This water fountain series combines genuine multi-color Indian Rajah Slate with water flowing passed polished river rock creating a soothing sound and awesome focal point for any room. Now including Full Spectrum LED Lighting. This fountain is engineered with Bluworlds splash-free design and features the new *NSI Slate. Simply hang on the wall per the instructions and finish with the trim kit color of your choice.